Diaper cake poems can add a special touch to your diaper cake design. Poems can help you express your best wishes to the mother-to-be in a creative manner. Even if you are not skilled at poetry, you can find many free poems online. It is also not difficult for a beginner to write a cute poem suitable for a diaper cake. Learn how to write diaper cake poetry and where to find free poems online. Diaper cakes are a popular baby shower gift because they allow people to present a gift of a functional item, diapers, in a cute and fun manner. 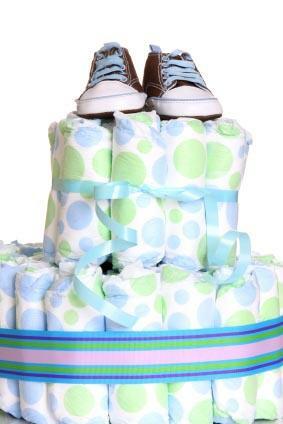 A diaper cake is made of one or more package worth of diapers folded and arranged in the shape of a cake. The cakes often include other baby gifts such as booties, pacifiers, blankets, toys or toiletries in the design. There are endless ways to create a diaper cake. Some people design a diaper cake around a theme, while others simply put together a group of unrelated baby gifts in a decorative manner. Many people present a diaper cake with a poem. Including a poem with a diaper cake may replace a formal card or add to the diaper cake theme. While there are many free diaper cake poems online, you can also write your own poem. Writing an original poem is a special gesture because it was created specifically for the mother-to-be. Does your diaper cake follow a theme? If so, you may want to write a compatible poem. For example, incorporate Winnie the Pooh and the characters of 100 Acre Woods in a poem for a Winnie the Poem diaper cake. What tone do you prefer for the poem? Diaper cake poetry can be sentimental, whimsical or humorous. Pick the tone based on the personality of the mother-to-be or the type of items in the diaper cake. Pick a poetic structure or form. There are many ways to write a poem, ranging from alphabetic sequence to a name poem. Most poems use meter, a way of arranging words so that the emphasis on certain words occurs in a regular pattern. Some poems are free verse and do not follow a set pattern of meter and may or may not use rhyme. Free verse poems may be easier for beginners. Rhyming may be fun to use for humorous or whimsical poems. If you are new to poetry, visit a site like Poetry Online to learn about poetry structure and terms. Once you have a better idea of the type of poem to create, it will be easier to write the poem. After you write the poem, copy the final version onto a homemade card or decorative paper. You can also create a scrapbook page with the poem, a special photo and decorative elements, if the mother-to-be is a scrapbooker. In fact, if you are the host of the baby shower and the diaper cake is a centerpiece for the event, consider creating a a starter baby shower scrapbook. Guests can sign the book or even create a page for the mother-to-be at the shower. The poem for the diaper cake can fit into the starter scrapbook. The mother-to-be can fill out the rest of the baby shower scrapbook at her leisure after she receives the photos from the baby shower. May this gift keep your baby cozy and warm. With a rattle to keep up the melodious beat. Sweetly sleeping in Mommy's arms. By the 100 Acre Woods animals and one special bear. Knitted cozies to keep little ones warm. All topped with baby's first teddy bear friend. If you don't want to write your own poem, the Internet has a large number of websites with free diaper cake poetry. Many of these sites are put together by regular people who want to share baby shower planning advice and poems that they used for previous gifts. Others are pages put together by companies that sell baby products. Creative Baby Shower Ideas: Creative Baby Shower Ideas has a number of different style poems for diaper cake projects. Sentimental poems and funny poems are included. Crafty Sayings: This site provides a selection of poems about diaper cakes which were contributed by forum members. SelfGrowth: This website has several poems for diaper cakes includine ones for genders and some that are based on themes. Consider diaper cake poetry for your next diaper cake project. It will be a fun way to put your good wishes for the mother-to-be into words.